ANC FS Provincial Chairperson Sam Mashinini lighting candles for the prayer. 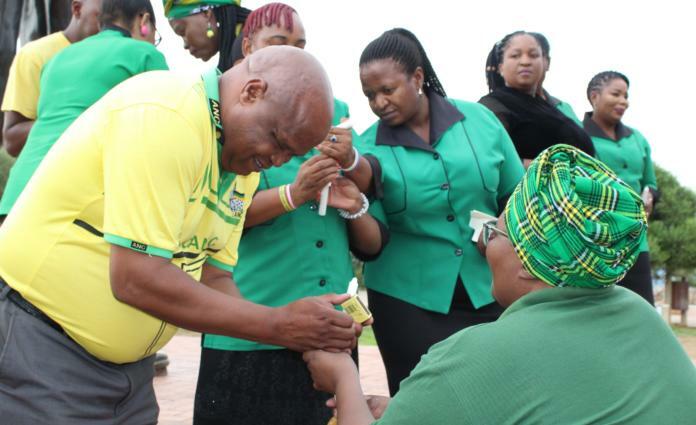 The Free State ANC calls for unity within its ranks. This was emphasised by Provincial Chairperson, Sam Mashinini, before a prayer meeting was held at Naval Hill on Monday in commemoration of the release of former President Nelson Mandela. The event was attended by members of the party’s Women’s and Youth Leagues. Onlookers were addressed by Mashinini, who is also MEC for the Department of Police, Roads and Transport. “When Nelson Mandela got out of prison on 11 February 1990 and stood before the people of South Africa, he said that he was not as a prophet but a humble servant. The message that we get there is that we need to be humble and united because if we are united the challenges we are facing will end,” he said. “Our message as the PEC (Provincial Executive Committee) is that we should be united as the Free State so that we can be stronger and I have no doubt that we have gone a long way to ensure that,” added Mashinini. The MEC also mentioned the significance of Waaihoek in the remembrance of the party’s history in social revolution. “Waaihoek is not just important for the people of the Free State alone. It is important for the world because when the liberation was born in 1912 it was not meant just for liberating South Africans but the whole world,” he said.